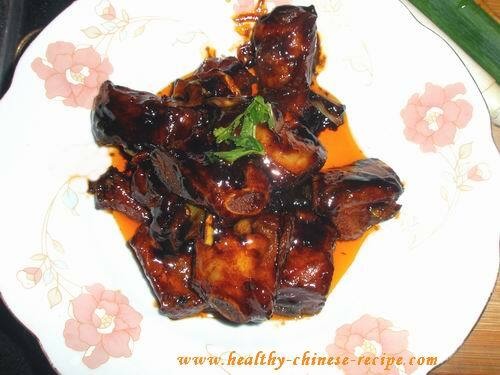 Sweet and Sour Pork Rib is many Chinese people's favorite dish. Google (China) had a top search list, in which "the most (Chinese people) want to eat dish" is Sweet and Sour Pork Rib. Though it's not my favorite, but I admit that it is the most delicious Chinese food. Sweet and Sour Pork is derived from it, which is westerners' favorite Chinese food. From this point we can say that Chinese people and westerners have the same favorite Chinese food. This delicious dish is started from Song Dynasty, about 1000 years ago. It's originated from Wuxi, a city of Jiangsu province(Jiangsu,Zhejiang and Shanghai are consist of Changjiang Triangle Area), but you can find it in almost any restaurant, any place, and any family in China. Because of this reason, it has many variations. Classic cooking is to deep fry pork rib, then coat a layer of sweet and sour sauce (by stir frying). The process is simple. The duration and the heat degree are important during cooking. Here is healthy Chinese recipes website. I should show you healthy cooking method as possible as I can. The healthy way to cook this dish is to boil first, then stir fry and coat sauce. No deep fry. The flavor of this dish is sweet and sour with very delicious fragrance. A little crispy outside layer while soft and tender inside. The bone is easy to be taken out. 1 Clean pork rib, cut into small section. One section for one piece of rib. 2. Add pork rib sections in a wok, add water covering it. Bring to a boil. Take out the pork. Throw away water. 3. Refill warm water to the wok. Add Sauce& Seasoning A. Bring to a boil. Turn to low heat. Simmer for 30mins. 4. Take out pork ribs. Pour soup in a big bowl for later use. 5. Heat oil, stir fry pork rib in Seasoning B till the edge of pork ribs become brown color. 6. Add Sauce B. Bring to a boil. Continue boil and stir fry till thicken. 7. Arrange on a plate, serve. Function: Moistening dryness, nourishing blood, and supplementing the kidney. It's good to the liver and the spleen. Don't eat frequently or large quantity. Suitable for young people. People with obesity or hyperlipidemia don't eat. Only serve 2 or 3 pieces if you cannot reject it.